Watson: Oh? Really? In what way, Mrs. McFarlane? Mother: His cruelty, sir. He was more like a beast than a human being. In scene 5, Holmes and Watson go to Blackheath to call on John’s mother. Holmes has been in a very good mood ever since hearing about Lestrade’s new evidence, the bloody fingerprint. The evidence led Lestrade and Holmes in two very different directions of investigation. For Lestrade, the investigation is over, but Holmes follows up on his new theory with a visit to John’s mother. The details Mrs. McFarlane told him about her former relationship with Jonas Oldacre did not conflict with Holmes’ theory. As he and Watson leave, Holmes is still in a very good mood. On his way out, he asks Mrs. McFarlane if he can borrow her measuring tape. 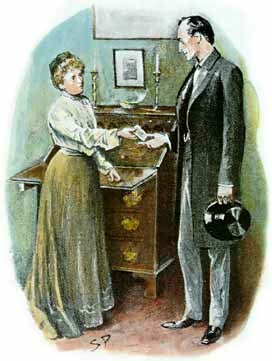 She lends it to him, but Holmes won’t confide in Watson to tell him what it is for. However, in a metaphorical way, he does answer Watson’s question. He says that perhaps he will be able to use it to hang the real murderer. The measuring tape is flexible, most likely made of cloth, so it is something like a rope that could be used for hanging. But it certainly isn’t strong enough for that. However, if the measuring tape could be used to turn up new evidence, that evidence could convict the real murderer. The punishment would be death by hanging, so in that way, the measuring tape could hand the real murderer.